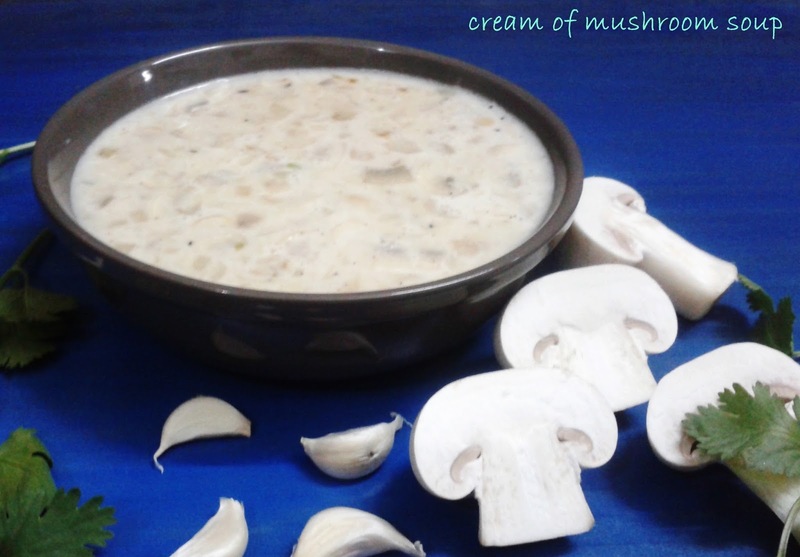 Melt butter in a pan and add onion, garlic and mushrooms an stir for 2-3 minutes. Now add water and wait till it starts boiling. Add cornflour dissolved in 1/2 a cup of water and stir continuously and cook for 4-5 minutes till the cornflour is cooked . Add milk,salt,pepper powder , nutmeg powder and cream and cook for a minute. Serve hot garnishing it with coriander or spring onions and fresh cream. Mix all the ingredients of pasta in a bowl. Add water little by little and knead soft dough as we knead for making chapattis. Cover the dough and keep it aside for 10-15 minutes on rest. Divide the dough in three equal parts, greese then with little oil or dust them with some flour and roll out in to a circular disk taking one at a time. Now cut chapati in desired shape either long strips or small rectangles or triangles. do the same with rest of the chapatis and keep aside. Boil 4 cups of water in a big vessel,add 1/2 tsp salt and 1 tbsp refined oil. Add pasta when the water is boiling hot and boil for 5 minutes.When it is done drain out extra water and put the pasta in cold water. When the pasta becomes completely cool,drain out the cold water as well and keep the pasta aside. Heat olive oil in a pan add diced onions,capsicum ,broccoli ,baby corn or corn,french beans and salt to taste and black pepper and cook for a minute or two. Add pizza pasta sauce,tomato ketchup,1/2 cup water and Amul cheese spread to it and mix well. Cook further for 2 minutes. 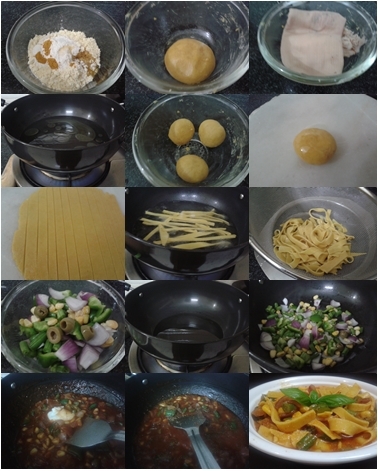 Now add boiled pasta to the above mixture and cook for 2 minutes. 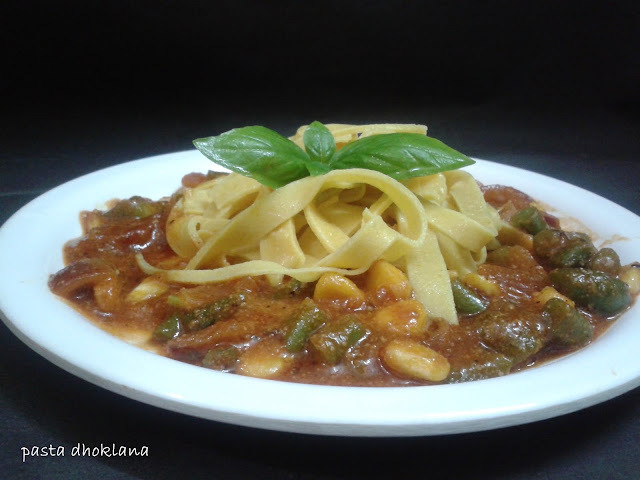 Now the pasta dhoklana is ready to be served. 1. 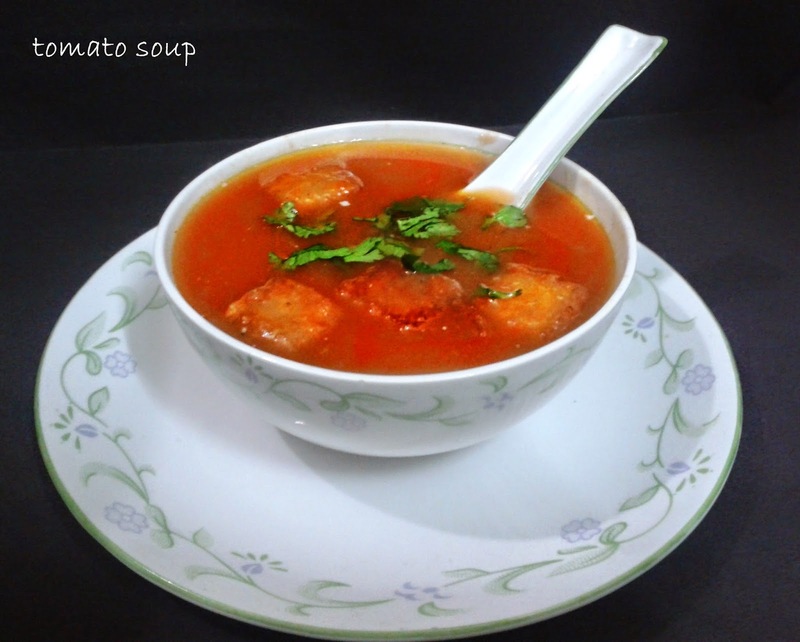 Pressure cook tomatoes,onion,potato,ginger garlic,carrot and ghiya with 6 cups of water till 3-4 whistles. 2. When the pressure releases mash the pressure cooked vegetables in a mixer or with a blender. 4. 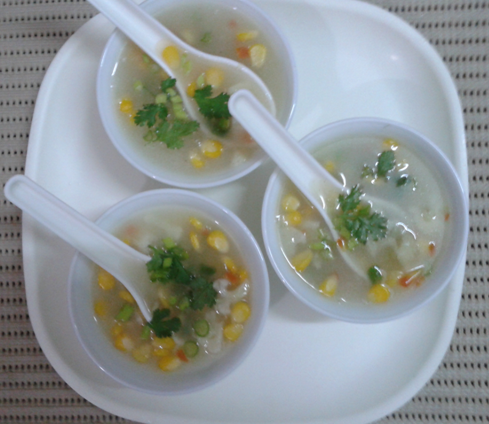 Add salt.sugar and black pepper and cornflour desolved in water and boil the soup for 5 to 10 minutes. 5. Serve hot and garnish with few drops of cream and chopped coriander. 1.You can cut the bread slices into cubes and toast them in an oven or in a frying pan to make croutons and put them in the soup while serving soup. 2. You can add tempering of one tablespoon heated oil with 1/4 tsp cumin seeds to the soup if you like spicy soup. Take butter in a pan and stir fry corn along with all the vegetables for 2-3 minutes. Add water and wait till it starts boiling. Dissolve cornflour in 1/2 cup of water and add this to the boiling water stirring constantly. Keep stirring and let the mixture boil for 4-5 minutes till the cornflour is cooked. Garnish with spring onions and coriander leaves. Serve hot with Chinese sauces. If you want to have a thick soup you can take 1/2 a cup more of corn kernels churn them in a mixer and add along water. Adding vegetables is optional you can add more (peas , finely chopped cabbage, onion or garlic) or less of vegetables as per your choice. To make it richer you can use milk or a mixture of milk and water instead of water only. Slice off the tops of the capsicums and remove the seeds.wash them and keep aside. Mix all the ingredients in a bowl accept oil and capsicums and make a filling. Stuff the potato mixture in the cavity of capsicums with the help of a spoon. If baking, then brush some oil outside the bell peppers, before you stuff them with the spiced mashed potatoes. Check after every 5 to 6 mins and keep on changing the sides of the capsicums, so that all sides are cooked well. check, turn the sides and cover the pan again. You also have to place the open potato side touching the pan. the capsicum will get golden and wrinkled. It may take about 25 mins to cook these on a low flame. If baking then preheat your oven to 200 degrees C. and place the stuffed capsicum on a greased baking tray and bake at 200 degrees C for 20 to 30 mins or till the capsicums become golden and wrinkled. 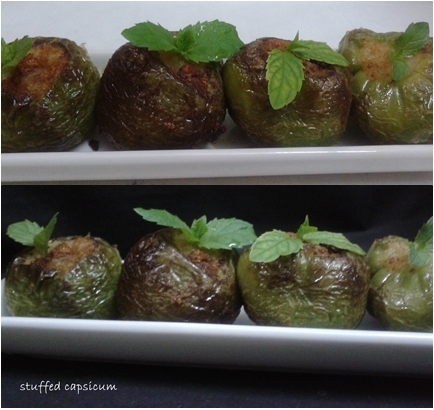 Garnish with coriander or mint leaves and serve these potato stuffed bell peppers hot or warm with rotis, bread or as a side dish. Wash and soak moong daal for 2-4 hours or over night. Drain out all the water and coarsely grind the daal in a mixer add very littile water if required. Stir the batter with a spoon for few minutes to aerate. Heat oil in a kadahi and drop spoonfuls of the moong daal batter in medium hot oil and fry till crisp and golden brown in color. Drain the moong daal pakoras on paper napkins or kitchen towel to remove excess oil. 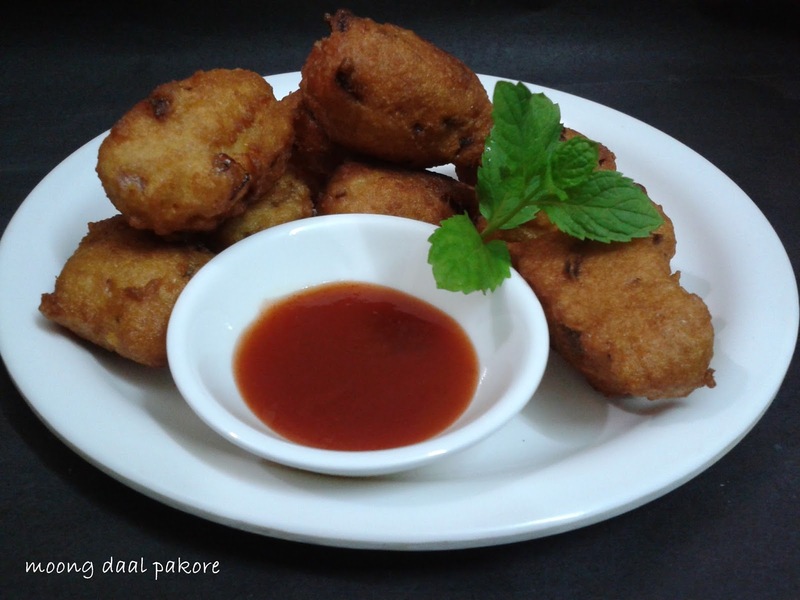 Serve moong dal pakoras hot with coriander chutney, tamarind chutney or tomato ketchup.